Many thanks for registering for an exhibition booth at ECSCRM 2018! and will be held in Hall 3 of the ICC throughout the conference. All enquires on site can be made at the main ECSCRM Registration Desks. Please download and complete the Exhibitor Site Registration form and email to the conference secretariat at ecscrm2018@warwick.ac.uk by 1st August 2018. This will ensure your booth name board is printed correctly and your members of staff have the necessary conference registration documents. Please provide this information by 1st August 2018. Additional full conference registrations can be purchased here. Bookings for optional sessions such as the tutorial, gala dinner and post conference tour can be booked here. Conference sessions start in Hall 1 at 09:00 each day. All refreshements and catering are served in Hall 3. Exhibitors will have access to lunch 30 minutes before the main conference lunch break time. The full conference programme can be accessed here. 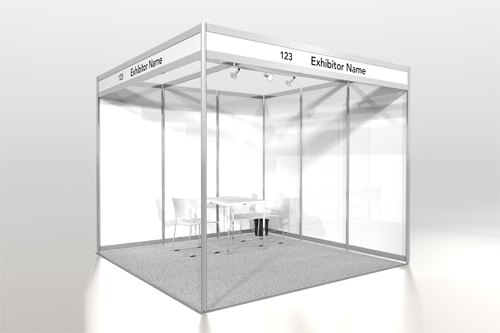 • A small booth is 2x2x2.4m and include a name board, one table, two chairs, 1 x 500w electricity socket and 2 x 50W spots. • A medium booth is 4x2x2.4m and include a name board, two tables, four chairs, 2 x 500w electricity socket and 4 x 50W spots. • A large booth is 6x2x2.4m and include a name board, three tables, six chairs, 3 x 500w electricity socket and 4 x 50W spots. • An extra-large booth is 8x2x2.4m and include a name board, four tables, eight chairs, 4 x 500w electricity socket and 6 x 50W spots. • If you require any bespoke shell scheme items or graphics, additional furniture or electrical items, these can be ordered directly with the shell scheme company, GES. Brochure and order forms can be viewed and downloaded here. The build of exhibition stands will be undertaken by the shell scheme company on the morning of Sunday 2nd September. Exhibitors will be given access to Hall 3 to set up and dress stands from 13:00 for completion by 17:00 ready for the exhibition launch at the Welcome Reception at 17:30 on Sunday 2nd September. The exhibition will formally close after the last coffee break on Thursday 6th September, around 15:30 (please check on site timetable for confirmation). Please ensure your stand is cleared of all materials and rubbish as soon as possible after this time as the shell scheme company will begin dismantling immediately after this break and any materials left on stands will be discarded. No access will be allowed to the exhibition hall whilst the shell scheme build and breakdown is underway unless individuals are wearing high visibility vests and safety shoes. These will not be readily available on site so exhibitors wishing to have access during this time must provide their own. As an exhibitor, you must ensure the health, safety and welfare of your employees, contractors and visitors as far as is reasonably practicable throughout the exhibition. You should ensure that your actions (or in-actions) do not give rise to accidents, injuries or unsafe working environments, provide proper information, instruction and training and supervise all parties throughout the show. You should also check that any contractors, suppliers, agents, etc that you may be using have a Health & Safety Policy, suitable to the exhibition environment. The full ICC rules and regulations that must be abided by are available here and we advise you to download and read these. Your attention is drawn to the Health & Safety at Work etc Act 1974 and the regulations made under this act and are reminded that the duties imposed by these laws are not reduced, regardless of whether an employer is in their own office or participating at an exhibition. Failure to do so represents a breach of the law, and could result in the prosecution of an exhibitor/contractor by the Health & Safety Executive (HSE). All exhibitors must complete a Risk Assessment (RA) for the exhibition, which covers the activities taking place on the stand during the open period of the event. This does not need to be sent to us, although you must be able to produce it on site if called upon to do so. We have included a template to help you if necessary, simply click on the link to download and print the form. If you wish to ship anything ahead, items can be received NO EARLIER THAN FRIDAY 31st AUGUST. Please ensure that the shipping note is affixed to any items being delivered. If you wish to have items delivered and offloaded during the morning of Sunday 2nd September, please note this on your exhibitot site registration form and you will be allocated a timetabled slot. Any parcels left at the venue must be clearly marked ready for collection and left in Bay B/Goods Inwards. It is the responsibility of the individual exhibitors to ensure their goods are packaged up and moved to Goods Inwards. For assistance with moving items, please contact the main ECSCRM registration desk where will arrange for a porter to contact you for assistance. Collection must be made WITHIN 3 WORKING DAYS of the end of the conference (Tuesday 11th September 2018) and it is the responsibility of individual exhibitors to arrange their own courier. If you require any bespoke shell scheme items or graphics, additional furniture or electrical items, these can be ordered directly with the shell scheme company, GES. Brochure and order forms are available below. It equipment can be ordered via the venue. IT equipment can be ordered through the venue http://www.theicc.co.uk/exhibitor/ordering-services/ on this link, quoting passcode 62935. As with previous ECSCRM/ICSCRM meetings, we will be hosting an industrial session allowing the top 15 industrial contributors (sponsorship and exhibition revenue paid directly to ECSCRM 2018 - this does not inlcude any additinal items purchased via GES) to take to the stage and share their company's vision and latest developments in their field. This session will take place on the evening of Monday 3rd September. You will be notifed after the final deadline for sponsorship and exhibition orders (31st July 2018) whether your organisation has secured a slot in the ECSCRM 2018 Industrial Session. Further details will then be provided. All are welcome to attend this session.